Weathering a storm means toughing out predicaments. The storm eventually passes with patience and persistence typically rewarded. Not on Wall Street. In an era of high frequency trading and derivatives patience and forbearance are no longer virtues. All kinds of storms (e.g., economic troubles, anticipated market pullbacks, Federal Reserve meetings, consumer sentiments) cause point-and-click investors to dump their investments to move into something “safe.” Rebalancing investments creates an illusion that a person taking immediate action is averting or avoiding an expected market storm. 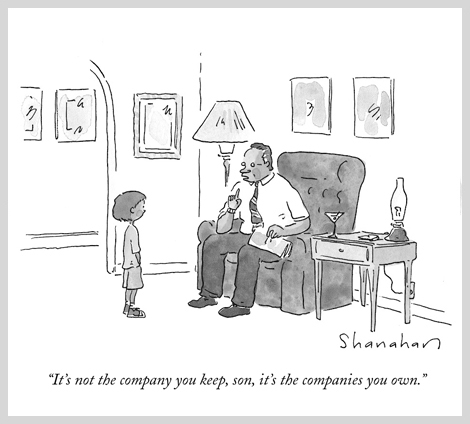 Since there is nothing profitable (e. g., no commissions) associated with holding firm and in place, the basic rule in the financial services industry is that if you own it you should sell it, and that if you don’t own it you should buy it. Instead of enduring financial squalls with a well-crafted portfolio of money-making companies, individual investors become subject to scare tactics – perish the thought that you may have “headline risk” (i.e., you actually own shares of individual companies). The indictment that your portfolio is too concentrated and you need to “diversify” is usually to segue into purchasing “safer” indexes, annuities, ETFs, and mutual funds or opaque products. Owning several profitable businesses via a stock portfolio is nowadays passé. John C. Bogle, retired founder of the second-largest mutual fund company in the world, advocates that everyone forget about specific stock portfolios and just invest in indexes. Warren Edward Buffett, the most successful investor of the 20th century, agrees. However, neither Bogle nor Buffett did that. Bogle started and owned a substantial interest in a specific enterprise, Vanguard Mutual Funds, a real business. Buffett holds major interests in hundreds of companies and is one of the largest shareholders in Coca-Cola, Kraft Foods, Proctor & Gamble, and Nike. Although he touts index funds Buffett doesn’t own any as best anyone can tell, and never has. Seasoned long-term investors know there’s no way to avoid financial storms and systemic risk. The way to weather roiling financial markets is to expect turbulence and then to construct an investment portfolio that will survive and grow under all types of conditions. At DeCamilla Capital we believe letting market volatility dictate long-term investment behavior and policy is a mistake – and that patience remains a virtue.